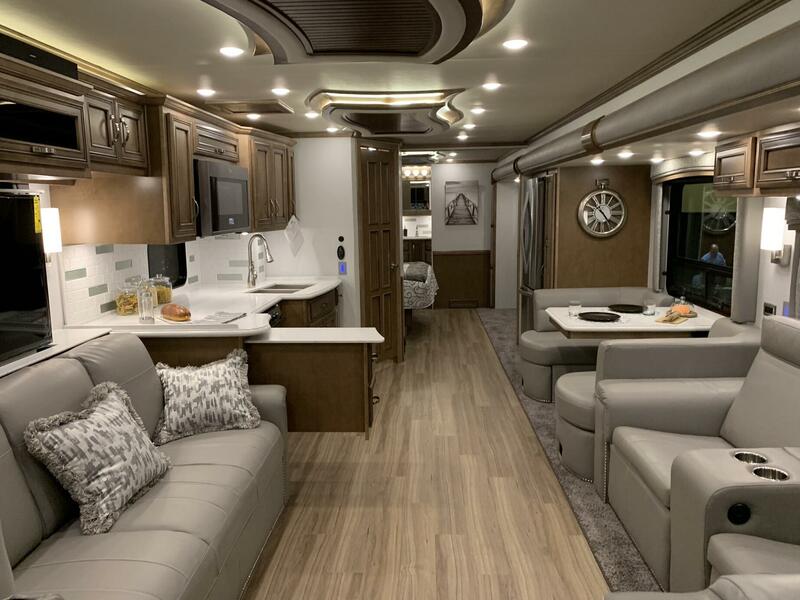 When Newmar’s product planning team looked ahead to the 2020 model year, the Ventana LE and Ventana brands were due for a life cycle change. In development of the plan for these two volume products, it was determined that a major change to the Ventana product line was going to provide an opportunity to create uniquely different front and rear caps for the Ventana LE and Ventana for 2020. In essence, the door was open to further separate these two brands. It was decided to use this opportunity to completely redefine Newmar’s entry priced diesel product… to give it its own identity as well as give it its own new and fresh look. The new name for this brand would be very familiar to Newmar dealers. 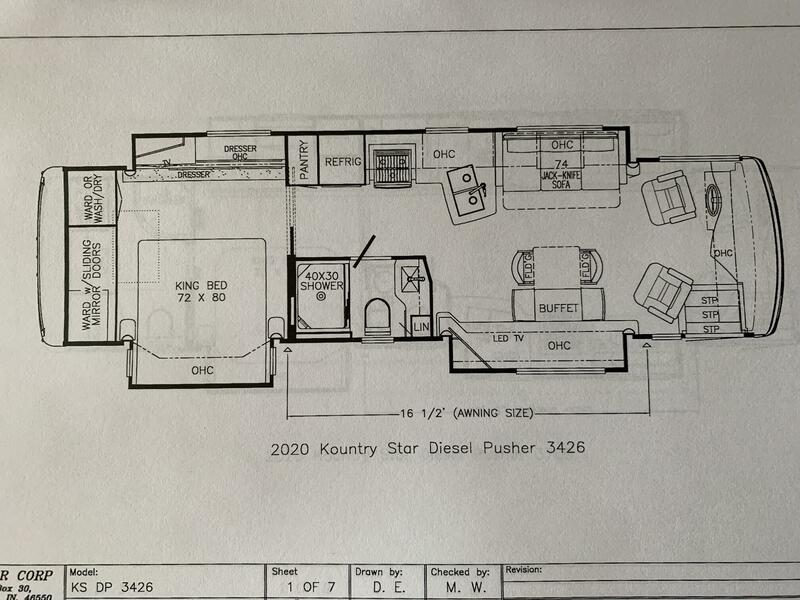 It is an iconic name in the Newmar family…… Kountry Star. 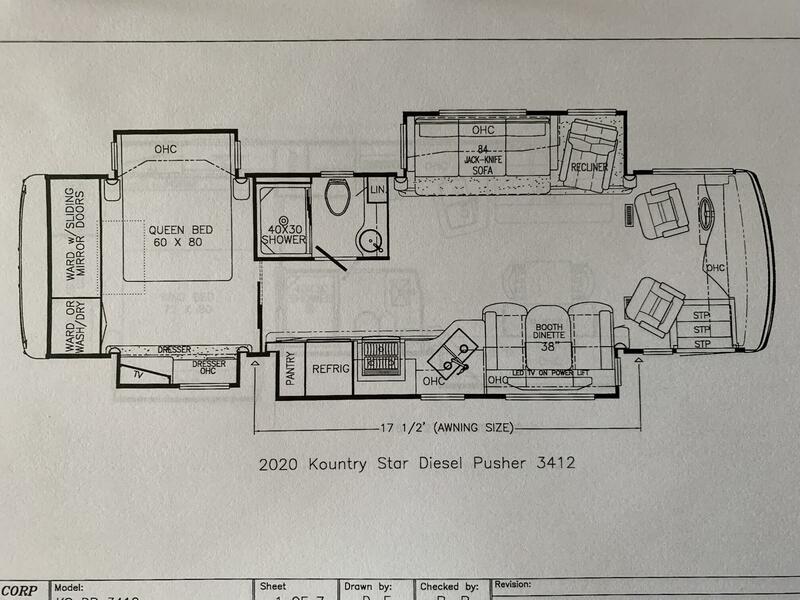 The new 2020 Kountry Star will offer 7 of the 8 Ventana LE floor plans that were available in the 2019 Ventana LE. The 3412, 3426, 3709, 3717, 4002, 4037 and 4045 are in the model line-up for the new 2020 Kountry Star. The 4048 floor plan from 2019 has been discontinued. 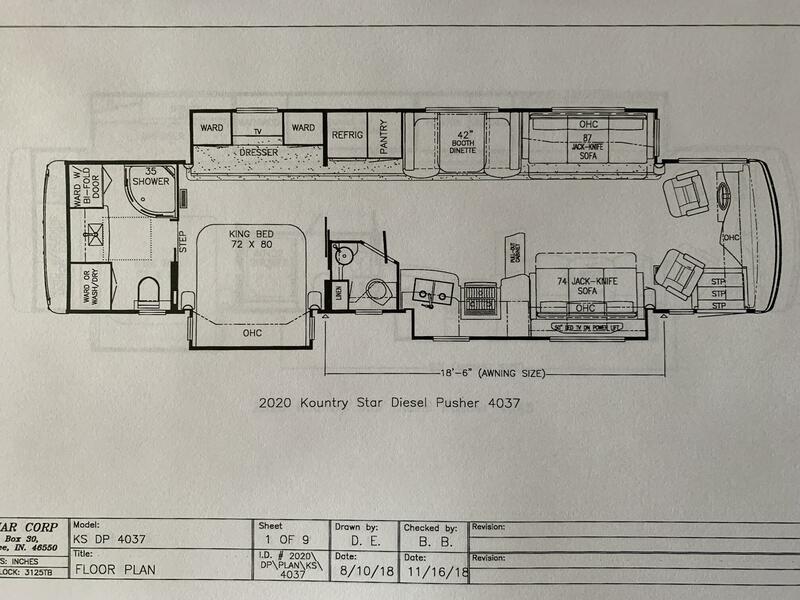 The new 2020 Kountry Star 4054 is a quad slide 40’ model with a rear bedroom and very large walk through bath mid-ship. 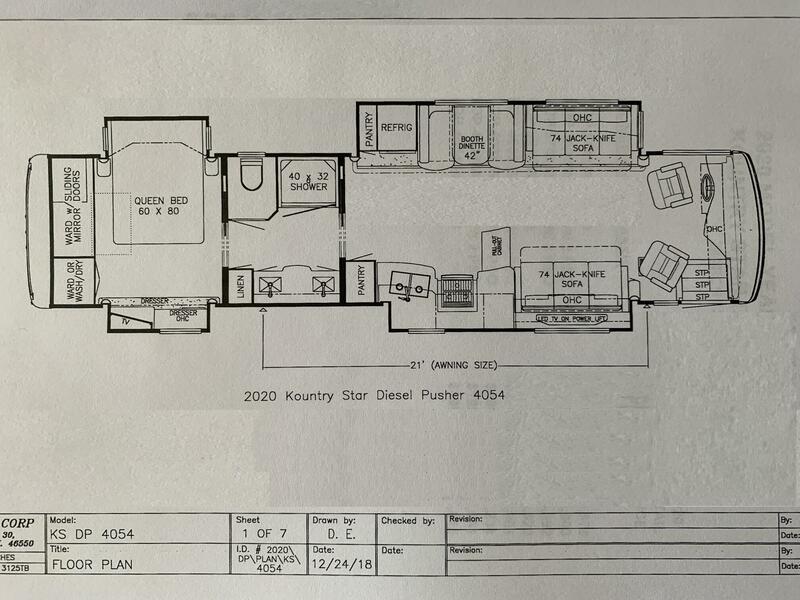 The front portion of this floor plan provides a 74” hide-a-bed sofa, booth dinette, refrigerator and pantry in the off door side slide room. 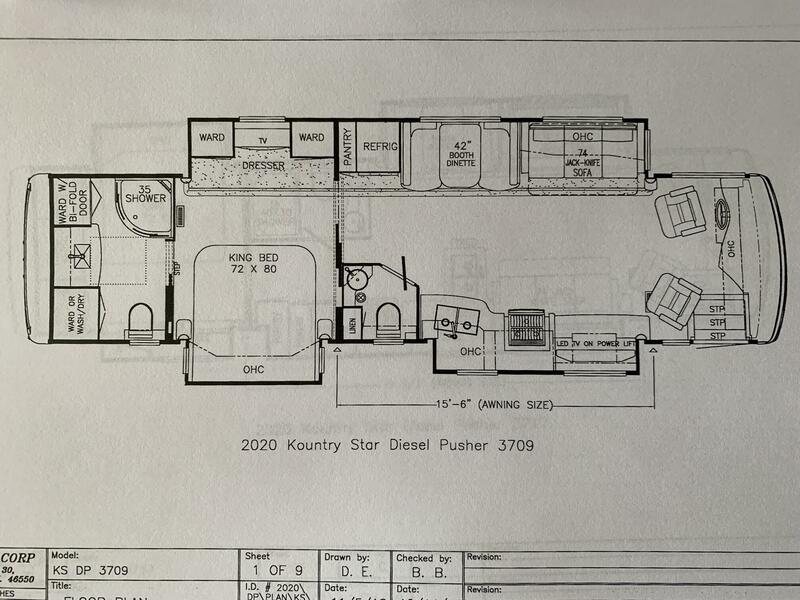 The door side slide out offers an opposing 74” jack-knife sofa with “televator” as well as a great galley with pull out counter and large pantry. A large and roomy walk-through bathroom area with private toilet, 40” X 32” glass enclosed shower and a two sink vanity across the hallway as well as linen storage. 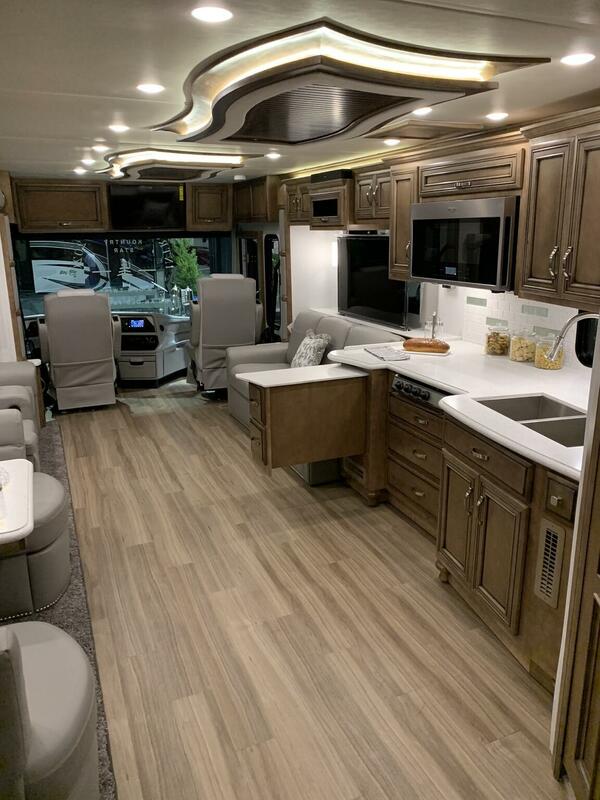 The rear master bedroom provides a queen bed measuring 60” X 80”, dresser and television across from the bed as well as a full hanging wardrobe along the entire rear wall of the coach which can also house an optional 2-piece washer and dryer. The 2020 Kountry Star will feature Samsung brand televisions instead of the Vizio brand units offered in the Ventana LE. 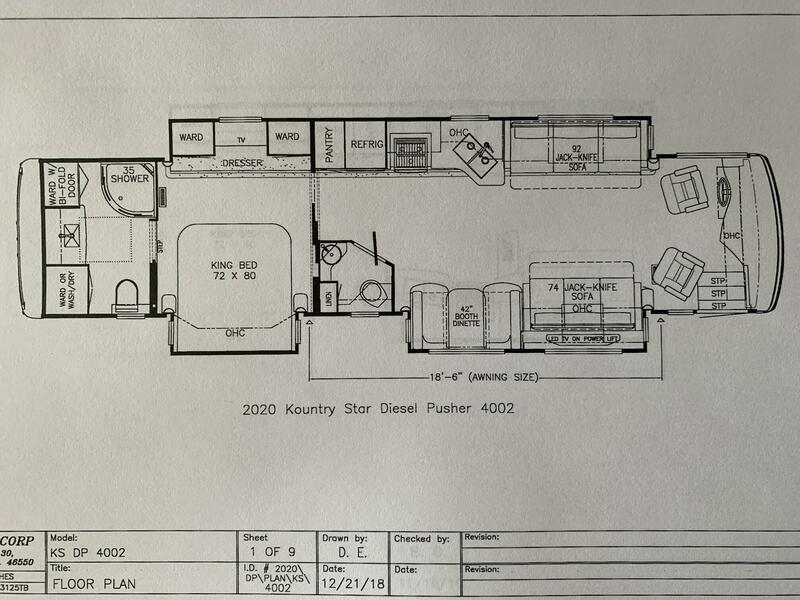 The galley will feature a 30” convection microwave with 3 burner cook top. This is an option taken on 97% of all the Ventana LE orders in the 2019 model year. The 2020 Kountry Star will feature new style of Flexsteel furniture. 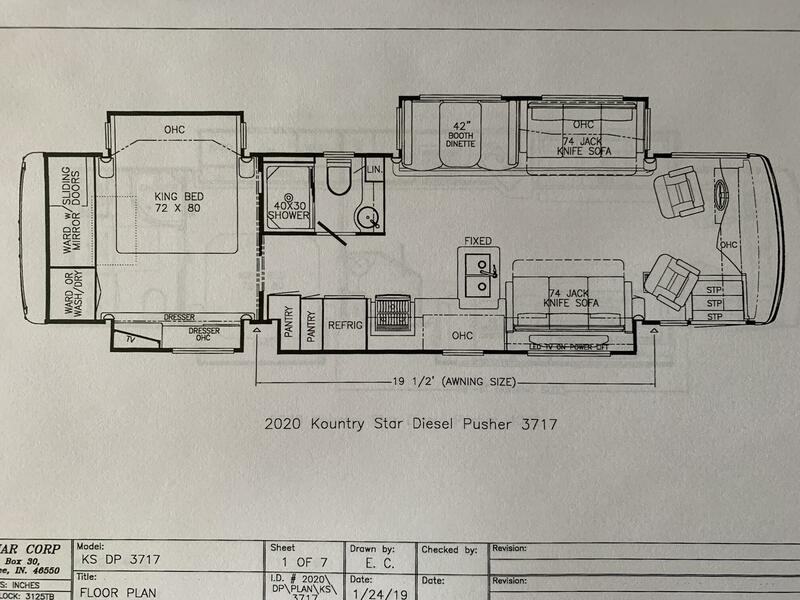 A new slide out fascia design made of hardwood will be a new feature in the 2020 Kountry Star. A new 4th wood grain is offered in Kountry Star. This will be called Arctic Maple with the standard wrapped style and Glacier Maple with the optional hardwood style cabinets. The 2020 Kountry Star features a new glass dash instrument panel. The transmission controls and engine brake controls have been relocated from the driver console to the steering wheel stalk on the Freightliner chassis. The Comfort Drive Steering control has been has been integrated into the digital dash menu and is controlled through the new steering wheel on the Freightliner chassis. 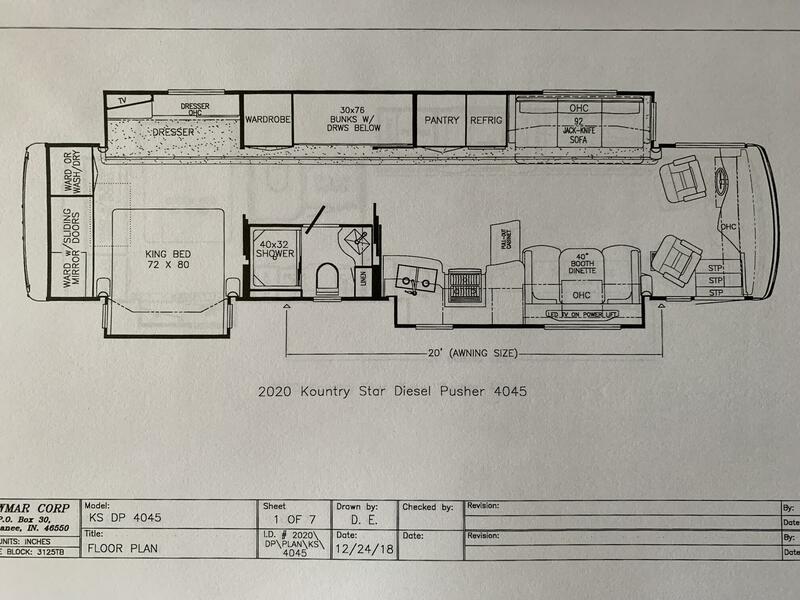 All 2020 Kountry Star models (34’, 37’ and 40’) will provide the Cummins ISB engine with 360 h.p. and the Allison 3000 series transmission and a 10,000 pound tow hitch. New wall sconces will be featured in the 2020 Kountry Star. A Xantrex 2000 watt pure sine wave inverter with 4 – 6 volt batteries replaces the 1200 watt inverter and 4 – 12 volt batteries previously offered in 2019. This was an option last year and was selected on 94% of the 2019 Ventana LE orders. The 2020 Kountry Star is highlighted by newly styled front and rear caps. The exterior baggage doors, as well as the fenders, on the 2020 Kountry Star are taller in height. The new Kountry Star also offers new exterior graphics and colors. A one piece molded fiberglass roof is standard. 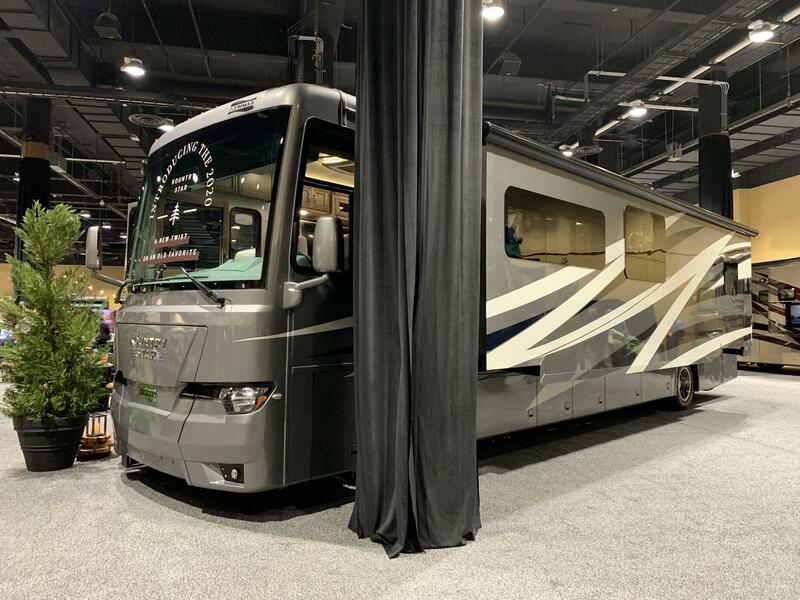 The 2020 Kountry Star will feature new decors including a 3rd décor selection (only 2 interiors offered in the 2019 Ventana LE). 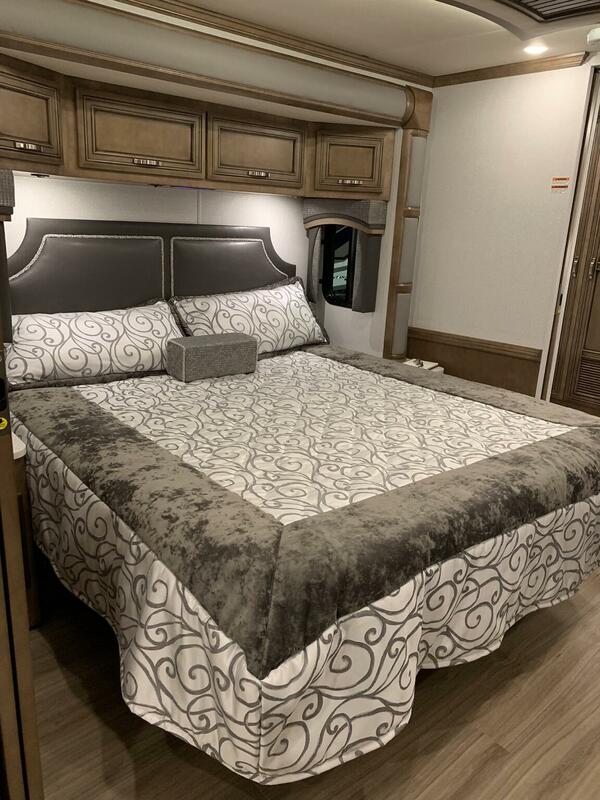 The new Kountry Star offers new style door & drawer hardware, newly designed feature ceiling, new dash colors, counter top edging as well as fresh & new decorative bedding. LED strip lighting above the kitchen will include lighting above the sofa or the dinette (in kitchen slides only). 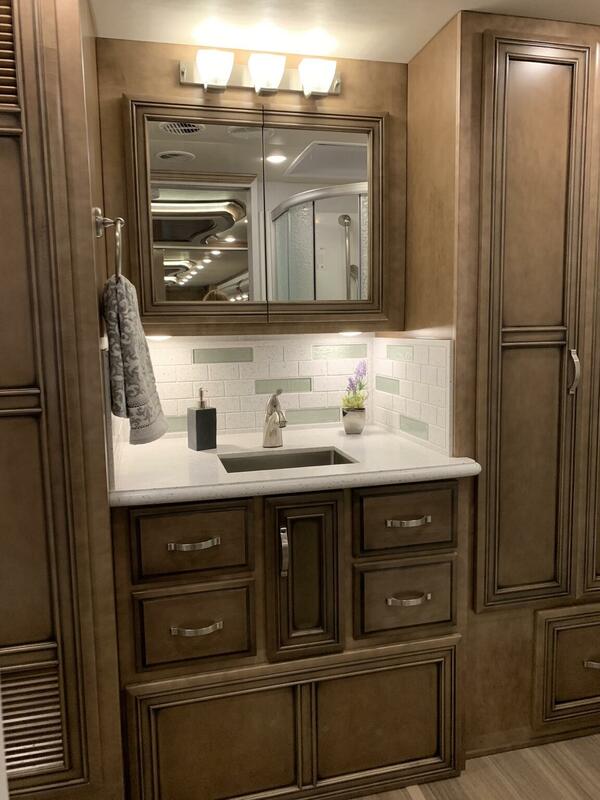 A New rectangular stainless steel provides a fresh look in the vanity of the master bathroom in the 2020 Kountry Star. Pass through basement storage is taller by 2” on the 2020 Kountry Star. The scissor style automated mechanical lock arms introduced in the 2019 Ventana are standard in the 2020 Kountry Star. The patio awning will include LED strip lighting. A 4th color has been added to the vinyl plank flooring option on Kountry Star for 2020. This 4th wood finish was designed to coordinate with the new “Arctic” wrapped style and “Glacier” hardwood cabinet colors available this model year.